This is surreal! I mean what happened to me today. Let me tell you the whole incident. This afternoon as I was coming through the main gate of the Osho International Meditation Resort, savouring a peaceful joy within me, I was stopped by twittering birds on the tree near the welcome center. 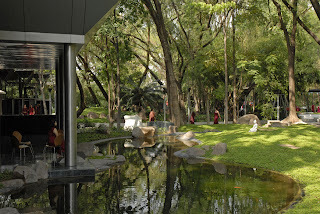 I halted and looked around -- the green expanse behind the welcome center, the calm Buddha statue of white marble, small waterfall behind it, and the curve of the running canal-- soft winter sun cast a diffused light on the green profusion…Perfect synchronicity between the outside and the inside. I breathed in silence and tranquility. Osho was talking ( in the video, of course) on Zen. And believe me, the same kind of birds twittered in the video, Osho stopped while speaking and said , " just like that --- silence sprouts within you…"
It was unbelievable! How could it happen the same day? One has to agree with Osho when he says, "Life is a mystery, that is the very essence of Zen." Osho said in the video, "Just act with your totality -- continuously -- and wait for the right time. The flower blossoms and the rain comes, the sun rises and the birds sing. ( at this point birds start twittering. Osho stops and says ) Just like that -- absolutely naturally -- silence sprouts within you, brings flowers of the unknown, fills you with immense fulfillment. You know, although you cannot say a single word about it: you experience, but you have no explanation." "Life is a mystery, that is the very essence of Zen."